I vote paulies clutch too. Well, paulie you are the winner for this month of August. We are now moving on to September, If you want to put an entry in please do, just remember to put SEP in front of the photo. Haven't been on for a while sorry. Just wanted to say Paulie that clutch is soooo adorable!!!! Here is a picture of Noah taken today. I took this with a camera phone and resized it on photobucket. He isn't a showbird obviously but what a character. OMG Paulie those babies are to die for! These two photos are so cute. 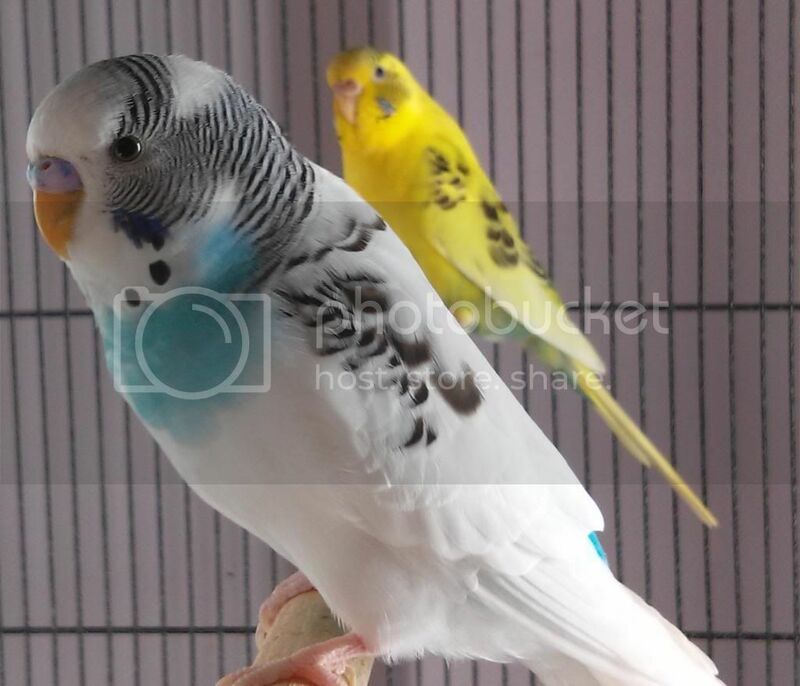 I really like the colors in both pictures, are these your budgies Rachelm? Hi Budgie Mad yes they are some babies I bred. You know that photo almost looks like a bird looking in a mirror Rachelm, that's a very cool effect. Yes it is Phoebes. They are some very nice looking budgies. You know Robyn this is one pretty bird. The background being light he could be overlooked but I was just taking a second look at the bird and realized she is splendid. That pattern on the wings is so much like lace. The lighting and background don't bring out the fact that she kind of looks like a porcelain doll. Yes you are right Phoebes. Well it is time to vote again, pls state the person and if necessary the number. Robyn's pretty hen gets my vote. I vote phoebes picture of Noah I have a soft spot for that mutation of budgie. looks like they are sharing secrets l.o.l. okay, well Rachelm is the winner for this month of September. We are now moving onto October, please add you entries and state OCT before the picture. Aww thanks for the votes everyone. Can I enter October comp too? gunna have to find a good picture just to keep a look in. Pics are great all round. Yes you may enter all of them.